SO YOU DON’T HAVE TIME TO COACH? I honestly don’t blame you for thinking that. If you’re a business owner or a manager in a business the last thing you need is to learn a new skill like coaching. So scrap sentences like “I want to implement a coaching culture” and change it to “I want to solve a problem I have in my business”. This could be anything e.g. make more profit, have more work life balance, have a proactive business rather than a reactive one, whatever is most relevant to you now. How you solve the above is by having better, more focused conversations with people and more importantly that don’t require you to the fix problems that are in your business. I was reminded of the diagram below when I watched a video clip from Michael Bungay Stanier this week. I’m sure many of you will have seen this before. This is typically what goes on in many businesses, particularly smaller ones who are looking to grow. 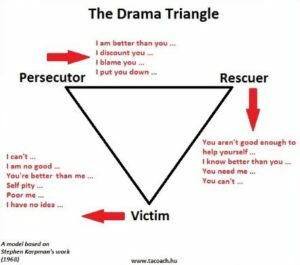 Whenever I’ve done this exercise with a group of people, it generally works out that when you ask the people in the room to identify themselves as one of the three, most people (particularly business owners) will identify as being a Rescuer. This is exhausting isn’t it? I have some news for you, you don’t need to fix everything and you don’t need to be a coach, you just need to be more coach like. This means implementing a structure of accountability and being open, honest and collaborative. You also need to hone your listening skills, have the ability to be comfortable with silences, perhaps have a model or two to work with, and that’s it. You don’t need a coaching qualification, just the above skills with a little bit of practice and you’ll be able to solve the problems you have. In the words of Michael Bungay Stanier “Stay curious a little longer and rush to action and advice a little more slowly”. Do you still think you don’t have time?